Well, my apologies for vanishing without warning. I took a vacation to the UK and left behind both work and hobbies. I spent most of the time in Bath, staying at the lovely Marshall Wade house thanks to the Landmark Trust, a very cool company that purchases historic buildings and refurbishes them for use as holiday rentals. We also made a few day-trips to London for a show and to finally visit Stonehenge (it only took 3 trips to the UK to make that happen). This is a gaming blog so I don’t want to bore you with my holiday snaps, but here are a few very minor gaming touch-points of the trip. 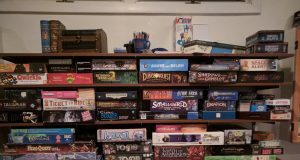 I cannot help myself – whenever in a new city I must find the local gaming store. 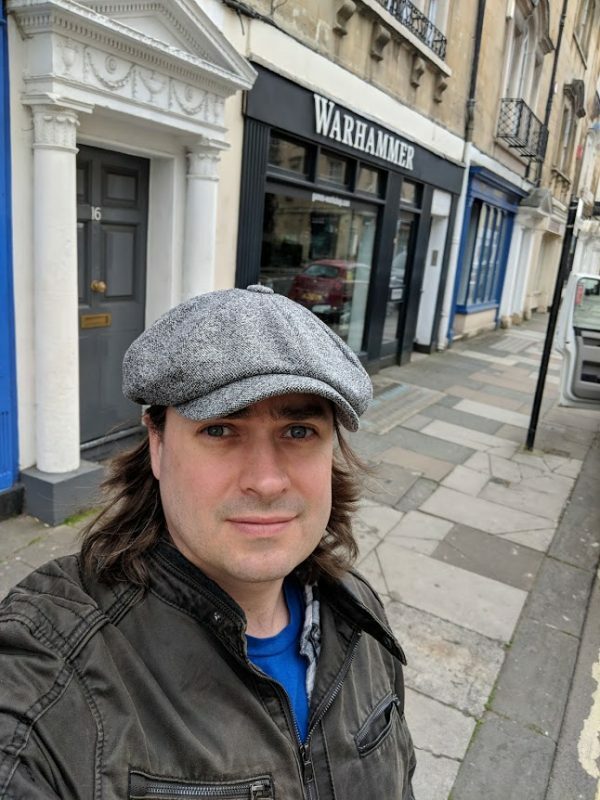 In this case I walked by the Warhammer shop in Bath. As you can see by the disappointed look in my face, it was closed. Unfortunately I discovered it in the morning and they did not open until noon. But I did peer in the window and it looked like a pretty standard GW shop, which aren’t so common in the US anymore, and as I don’t play their war games it didn’t hold enough interest to warrant a return visit. That said, I have been following the news about the upcoming release of Warhammer Fantasy RPG 4th edition. I played a lot of 2nd edition, which is my dear wife’s favorite RPG, so I’m eager to see if they fix my major complaints in the latest version. As of right now I’m hesitantly optimistic from the tidbits they’ve posted. I’ll post more on this later and will certainly have a full review when the game is officially released in June. I also visited a lot of historic sites, many of which were quite inspiring for gaming purposes. Stonehenge I imagine is well-trod territory for horror games, but the mood there is down right palpable, and the hour long bus ride from Bath with half a dozen strangers struck me as a pretty good intro for a horror game. I don’t have anything else to go on with that, but I love the cold open of strangers on a tour bus. I will have to ruminate more on that idea. The above detail is from one of the rooms at #1 Royal Crescent in Bath. It’s a nice little presentation of 18th century gambling paraphernalia, but what really struck me was the dice in the little dish. Is the card detail in the dish just a coincidence, and some museum curator thought it clever to drop a couple dice in there? Or are we seeing one of the earliest forms of dice trays? I imagine it’s much more likely the former, but I couldn’t help take a quick picture of it when I saw it. Finally, there was the Roman Baths and Abbey, both of which felt very inspiring for D&D. The idea of a lost ancient civilization poorly understood by the current medieval inhabitants is a theme I love to use in my own D&D world. Those who have played my campaign are well acquainted with dungeons located in the remains of ancient Emoria, whose name is a bastardization of Emor — Rome backwards. The baths strike me as an excellent setting for a new dungeon. Heck, I bet I could just draw a map from the museum pamphlet and start stocking it with monsters. He ruled in either 863 BC or 500 BC. He was imprisoned for being a leper and escaped. He created the hot springs through magic, or discovered them while working as a swineherd. He died when he hit a wall, or fell onto rocks, or broke his neck. He was the father of Shakespeare’s King Lear. There is no historical evidence that he actually existed. I love all the crazy alternate bits of information. He’s so mysterious! I’m really not sure how to work this into a game, but I fell somehow I must. 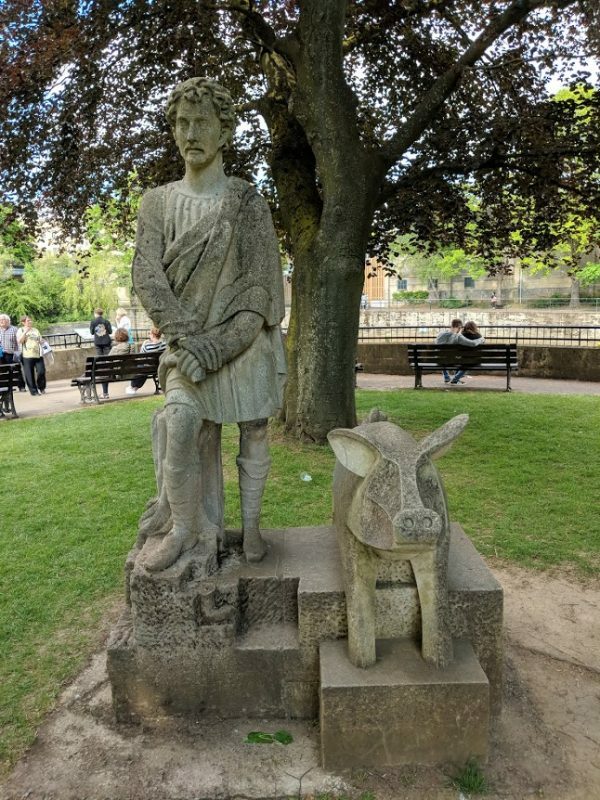 I guess that sums up my trip to Bath, or at least the tidbits that seem vaguely related to the interests of the readers of this blog. Thanks for listening to me ramble, and sorry for the extended silence. On with the gaming! It hadn’t clicked in my mind that you had planned a trip to England until I read the words “I’m back!” on your blog feed. Sounds like you had a splendid time! 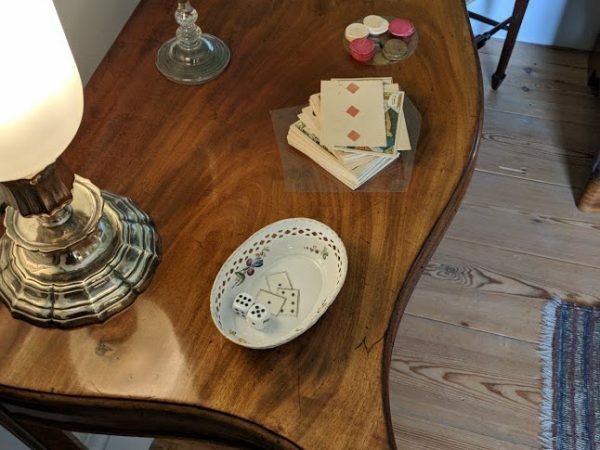 From all the gambling that the aristocracy did in their copious free time, I wouldn’t be surprised at all if that little dish was purpose made for something gambling related, although I do know that dice were considered low class and common. Proper gentry gamed with cards. I wonder if the number on the cards in the dish (8, by the look of it) has some significance, like maybe it’s the winning hand in some card game. You have an excellent eye sir – the statue of Bladud was created in 1859, the pig was added in 2009.